An investor should never be complacent and careless while making financial decisions. He must stay clear of myths [common myths about mutual funds busted] and make a well researched, understood and planned decision while investing in mutual funds [what are mutual funds] because an investment is not only going to deprive him of some portion of his income for present use but also if wrongly invested and handled, it might lead to a loss on the investments in the future. Any mutual fund investment process does not end with just putting in money in the preferred scheme. An investor needs to set time lines to reassess the scheme performance, see if there is any deviation in the scheme’s risk factor, scheme’s management and scheme’s goals and check if there is any change in the investor’s financial goals and in case the financial goal that was expected to be achieved through the investment has been achieved, he must decide whether to stay invested or not [know when to exit a mutual fund investment]. By keeping a track of the investment and changing economic scenarios, an investor will also be exposed to new and more rewarding mutual fund types or investment models or avenues. While most investors are attracted towards making mutual funds investments after knowing the benefits and features , many of them overlook the tax rates and taxation benefits for different types of mutual fund investments. For example, while choosing an Equity mutual fund scheme, an investor must understand that selling an investment after holding it for more than 12 months doesn’t required him to pay any tax on the gains. [tax on mutual funds in india] Similarly, while investing in ELSS mutual funds, an investor should understand that ELSS is a tax saving tool under section 80C of the Income Tax Act for those whose income is taxable. Equity mutual funds category gives the maximum returns. The point to be considered here is that while Equity MFs are attractive with high returns and no tax on Long Term Capital Gains, they carry high risk- a risk of low/ no/ negative returns depending on the performance of the companies in which the mutual fund is investing in and the overall economic and business conditions of the country. Moreover, equity should be opted by those in their early-to-mid phase of their life and investment cycles as they tend to have high risk taking capacity. Although equity is essential for good returns and investment growth, it should be supplemented by other types of less risky and fixed interest investments. One of the things that people do is they start mutual fund investments not because they feel the need to but because everyone else is doing it and because they have heard that investments are a must.20 things to consider while investing in mutual funds. One must invest only after assessing the future needs of the individual and family and after gaining some level of understanding of how a particular investment type works and performs. However before investing one must ask oneself some basic questions like- If and when will I need money in the future? Can I afford to start investments now? How much can I invest in a month/ year? What options am I looking at? How much risk am I willing to take? How much return or interest am I expecting out of my investments? 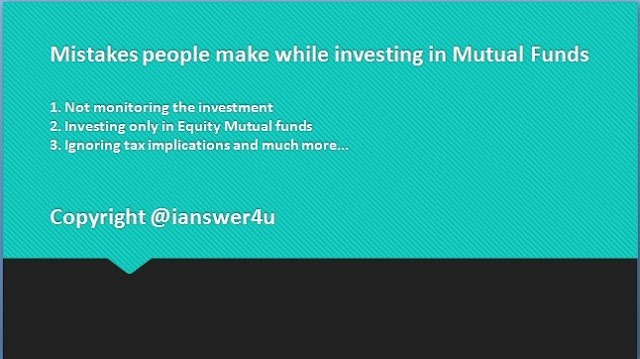 There are various types of mutual funds available that will cater of different types of customers. Every one of us is a bit shaken and worried when we see that the market and economy are unstable because that simply means that our investments are in danger, hence the natural instinct to quit the investment. Yet, Long term and SIP mutual fund investors need not panic at such times as in the long run everything stabilises and grows and volatility in the short run is inevitable and SIP mutual funds have an in-built feature which averages out the lows and highs in the NAV over the entire period of holding the investment. The moral is to stay invested and keep investing in the face of volatility and recessionary business cycle phase.